The Lady Ramblers stand together as the National Anthem plays over the gym. Its not very often that in the basketball season here at Fraser that both the guys and girls teams play at home on the same night, but on January 14th was the second time in the season that both teams played at Fraser starting with the varsity girls team voting the Tars of Anchor Bay high school. The girls had lost both of their teams the previous week to Lanse Cruse North and the reigning division winner Lakeview both by one point each. The Tars were coming in off a 39-14 win against Fitzgerald and were poised to keep their rhythm in tightly packed MAC Blue division. 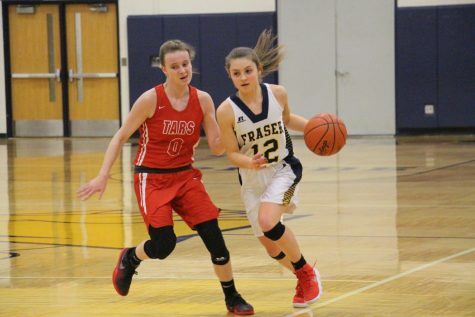 Hoping to avoid the longest losing streak of the season thus far, Fraser kept it close by shots made from seniors Elise Vitale, Bella Grillo and Sarah Schornack. By the end of the second quarter, however, Anchor Bay extended their lead by lading the Ramblers by eleven at the break. Senior guard Elise Vitale turns on the jets to speed past an Anchor Bay defender. the Lady Ramblers would go on to lose to the Tars 39-21. The second half was not even close, the girls could not get anything to fall offensively, committing turnovers, key players in foul trouble and gave up easy shots. The Lady ramblers dropped their third game in a row by the final score of 39-21 and then suffered their fourth loss in row at Chippewa Valley two days later by the score of 49-32. The Lady Ramblers will host the struggling Fitzgerald high school on January 22nd with hopes to end their four game skid. In the second game of the double header, the guys team that started out with one win and four losses, was looking to even their record out at five and five. Their opponent wasn’t going to take it easy on them as they welcomed South Lake High School. South Lake defeated the Ramblers earlier in the season and was a high scoring game. Senior Forward Tai Davis drives the lane converts the layup. The Ramblers hoped they could flip the script going onto that one. Even though the winner of the contest was going to be second place in the MAC Blue, Senior forward Tai Davis thinks this only the beginning. Ramblers Coach Matt Lockhart Sr, knew that this was not going to be a cakewalk of a contest and knew he had to make a well-advised plan in order to attack the South Lake offense and defense. Coach Lockhart’s game-plan was spot on. The Ramblers shut down South Lake both on offense and defense. Thanks to Tai Davis, Thomas McNellis , and other key contributors help slow their offense to only fifty-three points as the Ramblers came out on top sixty-five to fifty-three. The Ramblers would take second place in the division but Coach Lockhart thinks there is more to improve on from that game. ” We didn’t shoot free-throws that well today. That could of haunted us because they made some shots at the end and we needed to make more of them. With that win, the guys team took second place in the MAC Blue division and Coach Lockhart was really proud of the effort from his boys that night. 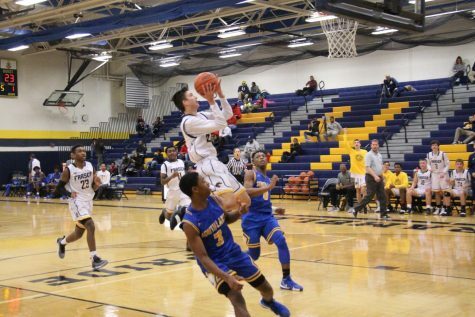 Junior guard Thomas McNellis attempts the contested layup in the lane. The Ramblers would go to win 65-53. Two days later however, the guys team fell to Warren Woods Tower High School 62-48 and are now sitting in third place in the division. 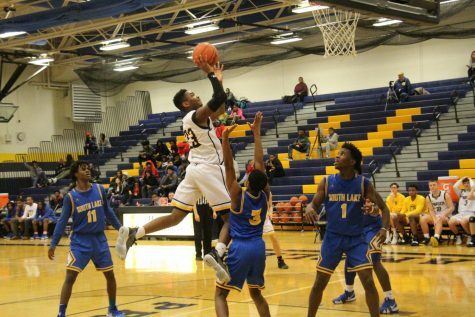 The guys team will look for a rebound on January 22nd and to even their record as they host St. Clair High School to start the week.